The quilting ladies of the Scottish village of Gandiegow are known to piece together more than just fabric . . .
Life isn’t going as planned and Sadie Middleton is rethinking her whole future. Thankfully one thing is staying the same: She’s able to share her love of quilting with her grandmother Gigi. The two of them enter a contest and win an all-expenses-paid trip to the Kilts and Quilts retreat in the Scottish Highlands. But their victory turns hollow when Gigi passes away before they can go. Sadie is grief-stricken, but her brother convinces her to take the trip to Gandiegow anyway. There she meets a charming circle of quilters who remind her of her grandmother—and Ross Armstrong, a handsome fisherman who brings a smile to her face. Newly single, Ross intends to enjoy his freedom. That plan goes awry as he comes to know Sadie—and a surprising spark is lit. 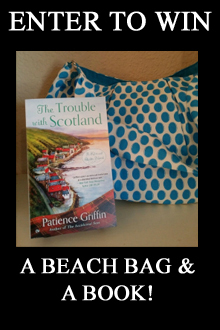 Too bad some well-meaning folks want to protect Ross from getting hurt again and are determined to keep him and the American lass apart. . . .
From the author of The Trouble With Scotland—a charming new romance set in the beautiful Scottish Highlands.